by Luke Alex Davis March 26, 2013 April 1, 2014 Leave a Comment on Flying Lotus & Thundercat Working With… Herbie Hancock?! Flying Lotus uploads a video featuring himself, Thundercat and Herbie Hancock in the studio. I’m still not ready to deal with this. 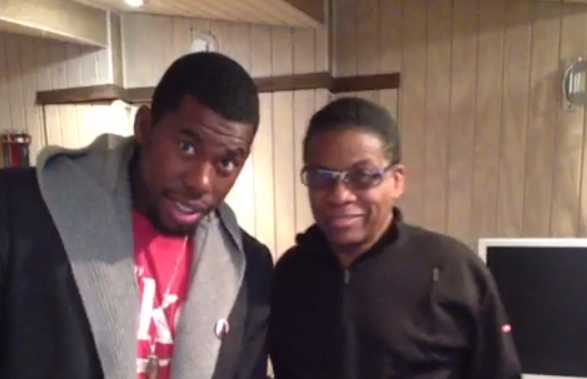 Yesterday, Flying Lotus tweeted a video entitled “Herbie” showing himself and Thundercat in the studio. That’s pretty awesome on its own but it’s not a surprise; they’ve been working together on Thundercat’s second album for the past few months now. But then you find out “Herbie” means Herbie Hancock, the legendary jazz musician, and he’s there in the studio using an iPad to make music. We discussed afrofuturism a few days ago when we featured King Britt’s Afrofuturism mix and Herbie definitely slots into that category having transcended six decades of music and technological advances and still keeping it fresh. If he does feature on Thundercat’s upcoming album, expect it to be ill. If they were just jamming… expect it to be ill but not necessarily released.